It is hardly surprising that Aleppo, one of the world's oldest continuously inhabited cities, is also home to one of the world's most distinguished and vibrant cuisines. Surrounded by fertile lands and located at the end of the Silk Road, which passed through Central Asia and Mesopotamia, Aleppo was a food capital long before Paris, Rome, or New York. Its diverse communities of Arabs, Kurds, Armenians, Circassians, and others contributed to its culinary traditions and produced a vast selection of different types of dishes - and no less than 20 kinds of kibbeh recipes. Here, one of the Arab world's most renowned chefs unlocks the secrets to this distinctive cuisine in this comprehensive cookbook filled with practical guidance on Middle Eastern cooking techniques as well as step-by step explanations of over 200 irresistible recipes, such as Chili and Garlic Kebab, Syrian Fishcakes, Lamb Stuffed Eggplants, Semolina and Butter pudding, and the queen of the mezze table, Red Pepper and Walnut Spread. Divided into 15 chapters (Basic Recipes; Appetizers and Mezze; Soups; Salads and Accompaniments; Grains; Fish; Poultry; Meat; Kibbeh; Stuffed Dishes; Vegetables; Stews; Bread; Desserts and Sweets; Pickles and Preserves; and Beverages), traditional cooking and preservation methods go hand-in-hand with modern combinations of flavors and today's desire for healthful and natural meals. 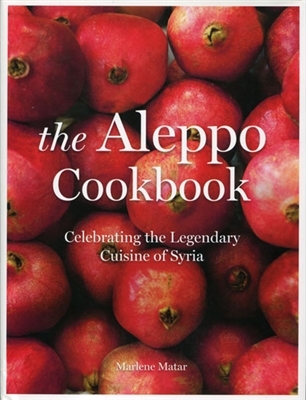 Wonderful full-color photography of the food, people, and markets of Aleppo make this a stunning cookbook, a great gift for food lovers, and a fitting tribute to a beautiful city and the suffering its people have endured. Marlene Matar is a highly accomplished chef and cooking teacher. She attended Beirut's L Academia Italiana Bella Cucccina, Montreal's Ecole Professionnelle de Cuisine Chinoise and received a Grand Diplôme in cooking and pastry from Le Cordon Bleu in Paris. In 1999, Marlene started her own cooking school and has since amassed a devoted following. She appears regularly on Lebanese TV and her work has been featured in numerous publications. She lives in Beirut, Lebanon.